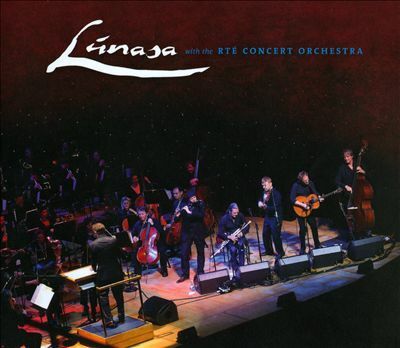 A look at albums we have written about in 2013 – here’s Lunasa and their 2013 release ‘LÚNASA with the RTE CONCERT ORCHESTRA‘ taken from Irish Music Magazine. Lúnasa have always been known for their innovativeness as a group and they have taken this skill to the next level with their latest collaboration with the national, classic treasure; the RTÉ Concert Orchestra. The Orchestra, under the guidance of their maestro David Brophy, have taken Niall Vallely’s intricate arrangements and added an empathetic element to the traditional instrumental prowess of the Lúnasa stalwarts. Take the Lecken Mór set which combines a beautiful choreography of wind instrumentals uplifted by the orchestral strings thereby creating a musical whirlwind of sound. This subsides into a backdrop for Smyth’s perfect fiddling, building to a resounding orchestration on Vallely’s title piece. Contrast this with the sombre introduction to the haunting pipes on An Buachaillín Bá, which is followed by a delicately picato string arrangement perfectly designed to welcome Crawford’s hypnotic flute in Scully Casey’s that drives into a fantastic version of The Dusty Miller. The lift in the Lúnasa instrumentation as they glide gracefully into The Red Bee is fully enhanced by their orchestral counterparts as they reveal a fabulously dramatic ending to a magnificent tune. The drama continues into the final set where each and every instrument is undoubtedly used to full potential, culminating in a fabulous end to a fabulous album. An added bonus is that it’s an enhanced CD so you get a peek of Lúnasa performing Morning Nightcap at the National Concert Hall, Dublin too. Vallely produces sophisticated arrangements with an effortless flair and, his ability to understand the interaction of the instrumental genres, ignites a spark between Lú˙nasa and the RTÉ Concert Orchestra that is fully embodied in this album. A stunning collaboration of musical work.